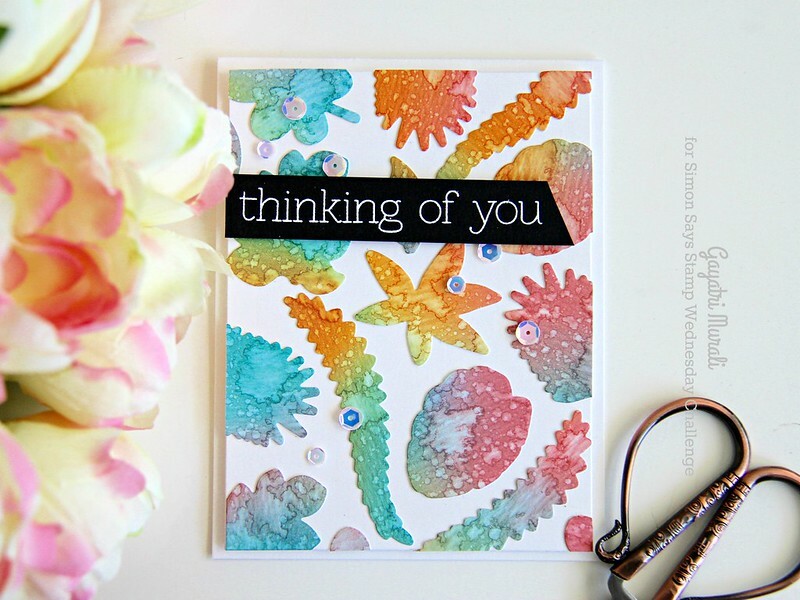 Adding colour and texture to your cards. Photo Heavy! Hope you are looking forward to your weekend or already enjoying your Saturday. 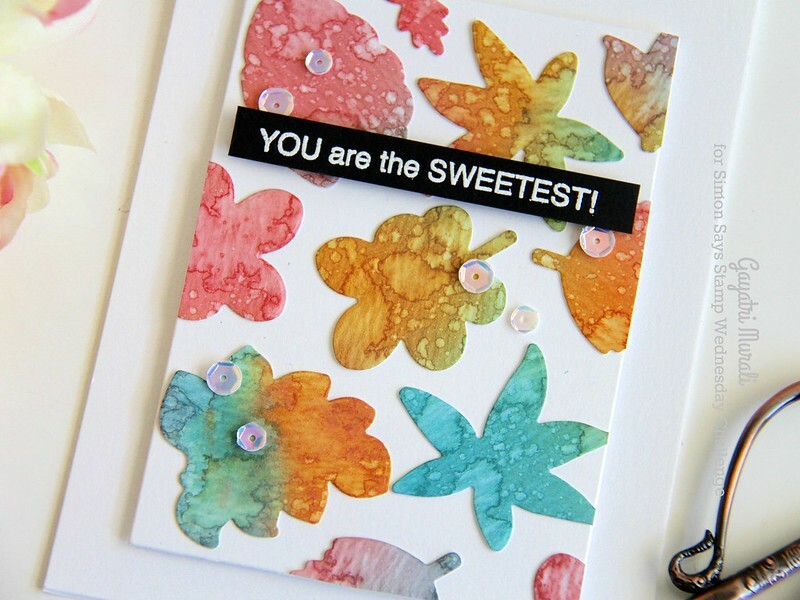 I shared with you on my social media the panels I created using the new distress oxide inks. They are so pretty I will tell you. The oxide chalky look and feel is amazing. I played with the inks an entire afternoon. One of the techniques I tried was the traditional Tim’s technique of applying inks to the mat, spritzing with water and smooshing the watercolour panel on it. Then I sprayed more water and heat set. I repeated this process to add layers. I love this technique. But I felt I did not get the intense colours on this technique and also I kind didn’t have control over the spatters, colours and the oxidation of the inks. I like bright colours, love spatters and also like to have a bit of control on what I am doing. So instead, I sponged the inks on the watercolour panel randomly first. This gives me control of how intense the colour I like and where on the paper. Hope this makes sense. Then I spattered clean water in small drops first, heat set them and then added more water in puddles, heat set…. repeated this process until I was happy. I had control over where I wanted the oxidation and keeping intense colours in some places to give a nice variation to the background. The panel on the far left is using the traditional technique and the middle and right panels are using sponging and spatter technique. You can see the difference. 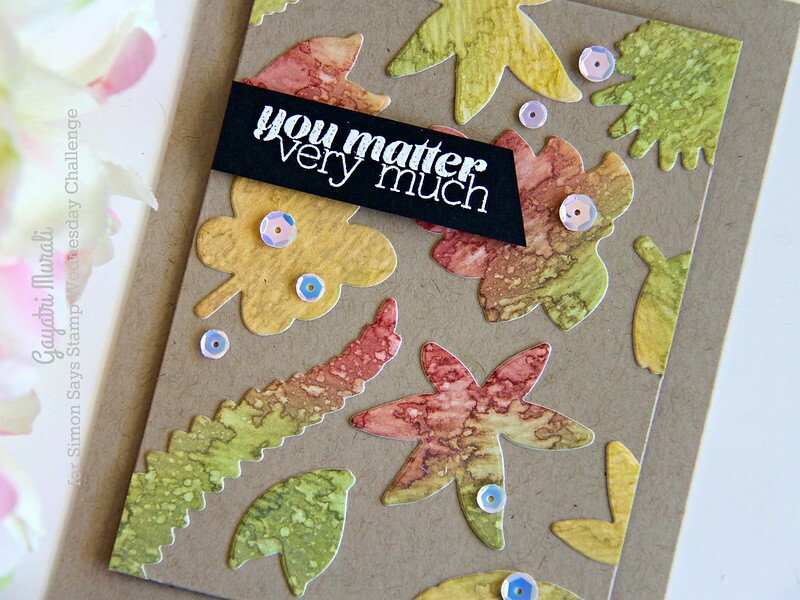 I have used the texture side of the Tim Holtz distress watercolor paper. 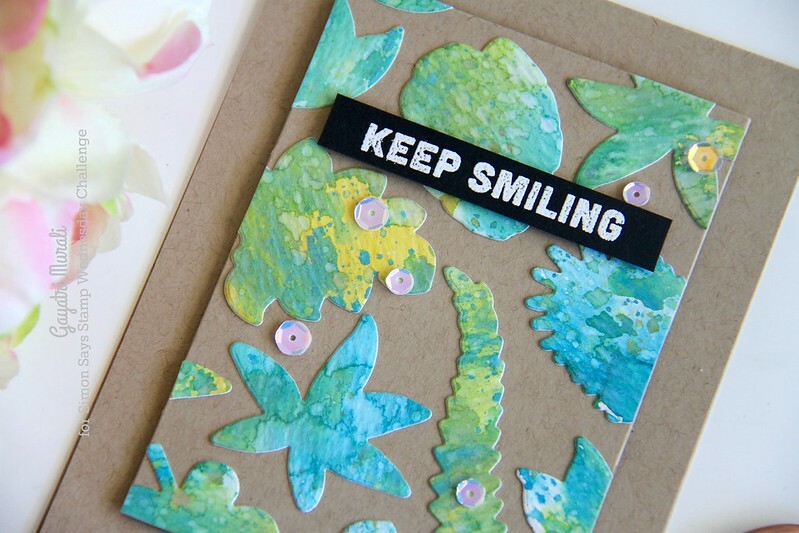 This is one way to add texture and of course you have the spatters and layers to add texture. You can use them as is for a background as they are beautiful. I die cut these using Simon Says Stamp Tropical Leaves die set to die cut the panel out. I made a set of four cards. Two using white as the base and two using kraft as the base. Here they are. I actually made another colourful panel similar to the centre panel and die cut lots of these tropical leaves. For this card, I die cut a white panel using one of the rectangle dies from Infinity rectangle die set from HA. I adhered the die cut randomly on the panel, trimmed off the excess, adhered the panel to the white card base using foam adhesives. 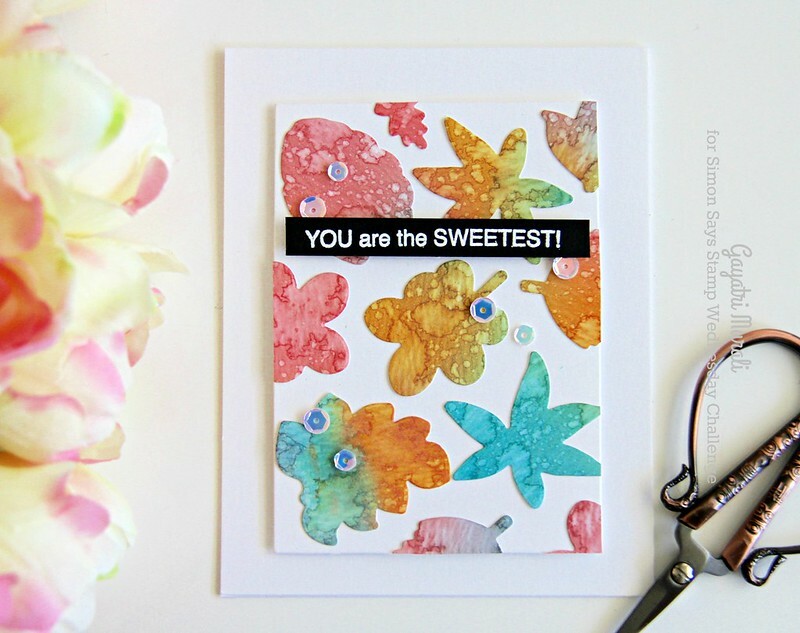 The sentiment is from Simon Says Stamp Sweet Cakes stamp set. I added some sequins to finish the card. Here is a closeup. Here is the closeup of the card. I used the other two panels I created using distress oxide inks on kraft base as the colours were muted. This Distress Oxide panel was created using the traditional technique I mentioned above. You can see in the closeup the layers of colours, some colours blended over the other especially the areas of green since I used Broken China and Fossilized Amber distress oxide inks only. This technique will be great for backgrounds. 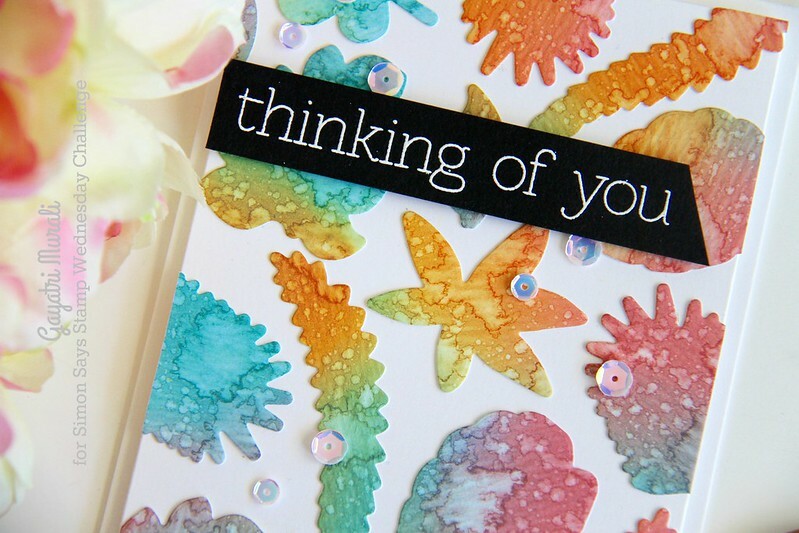 The sentiment is from Simon Says Stamp Thinking of You stamp set. On this panel below, I have used Distress Oxides Peeled Paint, Fired Brick and Fossilized Amber. I sponged them randomly on Tim Holtz distress watercolor paper, spatter water and heat set. Repeated the process many times till I was happy with the result. 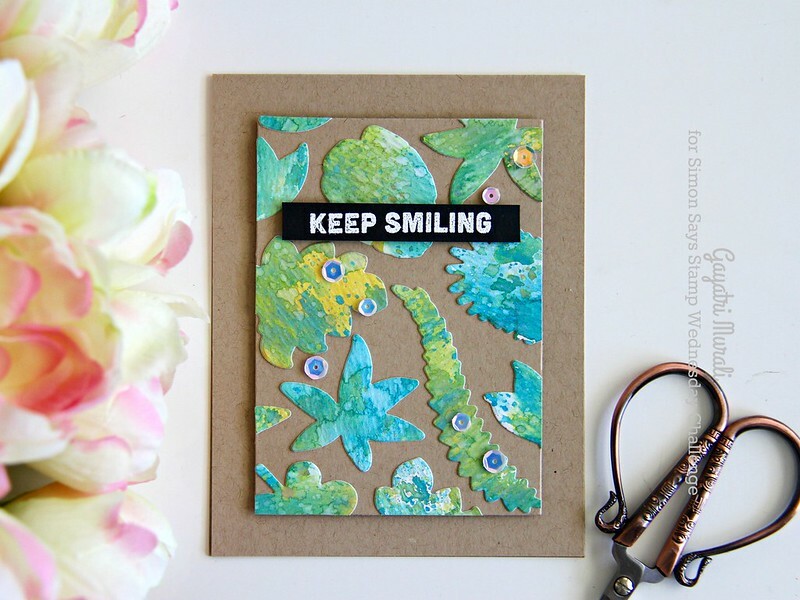 The die cut the panel using Tropical leaves dies from Simon Says Stamp. Same process as the previous cards. 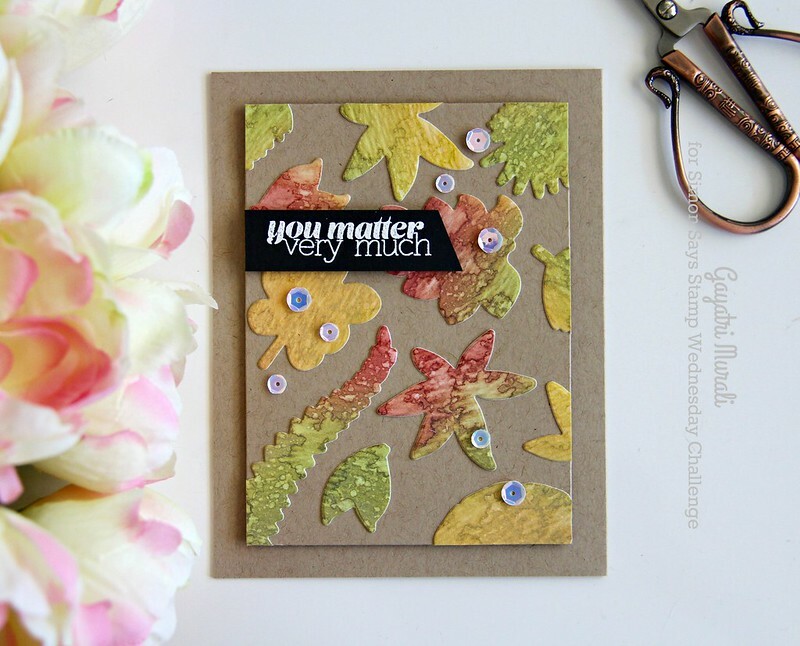 The sentiment is from Friendly Flowers stamp set also from Simon Says Stamp. Here are supplies I used to make these cards. Oh, awesome cards. Love that technique. I love this technique – the results are just beautiful. I wouldn't have thought of using the kraft background, but it really makes a stunning card. Thanks so much for sharing these.